Toyota Motor Corp has announced a global recall of 907,000 Toyota Corolla and Matrix models over a concern that an electric fault in the supplemental restraint system could cause the airbags to open unnecessarily – with 752,000 of those affected vehicles in the United States. 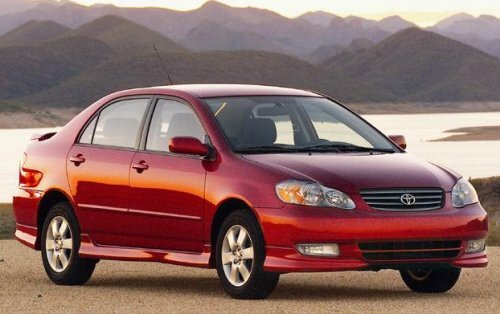 Affected by this new airbag system recall are the Toyota Corolla and the Toyota Corolla Matrix (known simply as the Matrix here in the US) from the 2003 and 2004 model years. In total, 907,000 sedans and hatchbacks around the world are included in this recall with 752,000 in the United States while the rest are located in Japan, Canada and Mexico. The freshly recalled Toyota Corolla sedans and Matrix hatchbacks are equipped with a supplemental restraint system (SRS) that controls the airbags and the seat belt pretensioners. The SRS electronics contain “application-specific integrated circuits” that control the various safety features and, unfortunately, it seems that these Integrated circuits are prone to shorting out. These problems are caused by electrical interference from other components throughout the vehicle. When these circuits short, the circuits could heat up to the point of damaging the restraint system electronics and once these circuits become damaged from heat – the various restraint system features are far less likely to perform as expected. In many airbag recalls, the concern is that the airbags will not open in the case of an accident but with the Toyota Corolla and Matrix recall, there is a possibility of the airbag opening on its own without being prompted by the force of an accident. There is also the chance that the seat belt emergency pretensioners could tighten without need but having your seat belt draw tight pales in comparison to having an airbag go off in your face while sitting in traffic. For those who have never been in a car accident where the airbags deployed, they open with an incredible amount of force to ensure that they are open during an accident before the driver or passenger has time to hit the windshield, dash or steering wheel. I’ve seen people have what looked like burns on their arms and face just from the airbag opening during a crash but that is a small price to pay to have the airbag save your life. However, imagine just driving down the road – or sitting in traffic – only to have the airbag suddenly explode in your face. Any injuries caused by an airbag during a collision are better than the damage to the body caused in similar accidents without airbags but having an airbag open for no reason poses not just a major safety risk to the occupants of the 2003-2004 Toyota Corolla and Matrix as well as the others on the road. Needless to say, having the driver’s side airbag open while driving would make it very hard for the driver to maintain control so if the car is being driven in traffic or in a congested area with lots of foot traffic – there is a high level of risk involved with this recall. This airbag deployment issue causing the recall of the 907,000 Toyota Matrix and Corolla comes after the Japanese automaker received 18 complaints of the airbags opening without reason. Luckily, only minor abrasions have been reported but with the level of risk involved with this problem – Toyota is making the quick decision to get these vehicles back to the dealership for repairs. To repair the issue, the dealership will install an electric signal filter to the airbag control module to prevent the interference from other components of the vehicle. These repairs should take about an hour and a half to complete and, of course, this work will be performed free of charge to the owner. what about the hubcaps?? every early matrix i see is hubcap-less havent they noticed this?????? What about the Pontiac Vibe? Is it the same SRS? And with Pontiac out of business, does GM have any responsibility?